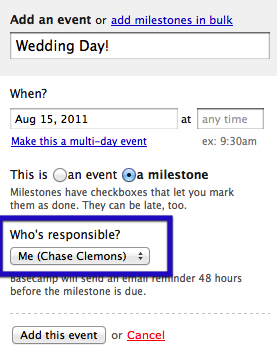 Basecamp Classic: How do I assign a milestone to someone else? To create a new milestone that’s assigned to someone else, click on the “Calendar” tab. Then click the “New event” link at the top of the page. You’ll see the option to create either an event or milestone. You can also create milestones in bulk if you’re adding lots of them to the calendar. You’ll see there’s an option to select the “Party responsible” for the milestone. Pick the person you want to be responsible and hit the “Save changes” button. To change the party responsible for an existing milestone, click on the “Calendar” tab. Then find the milestone you want, click on it, and make the changes needed. Just make sure to save them! Please note it’s not possible to assign a milestone to more than one person. One milestone = one responsible person.